Little People. 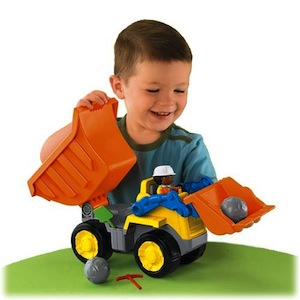 Load up on fun with the scooping and dumping action of the Dig 'n Load Dump Truck! Comes complete with boulders, so you can scoop 'em up, load 'em into the dump bed, then dump 'em back out and start again! Michael is there to "drive" the truck or work at the construction site with two tools he can actually hold in his hand! Michael can sit in the driver's seat and there's built-in storage for tools.